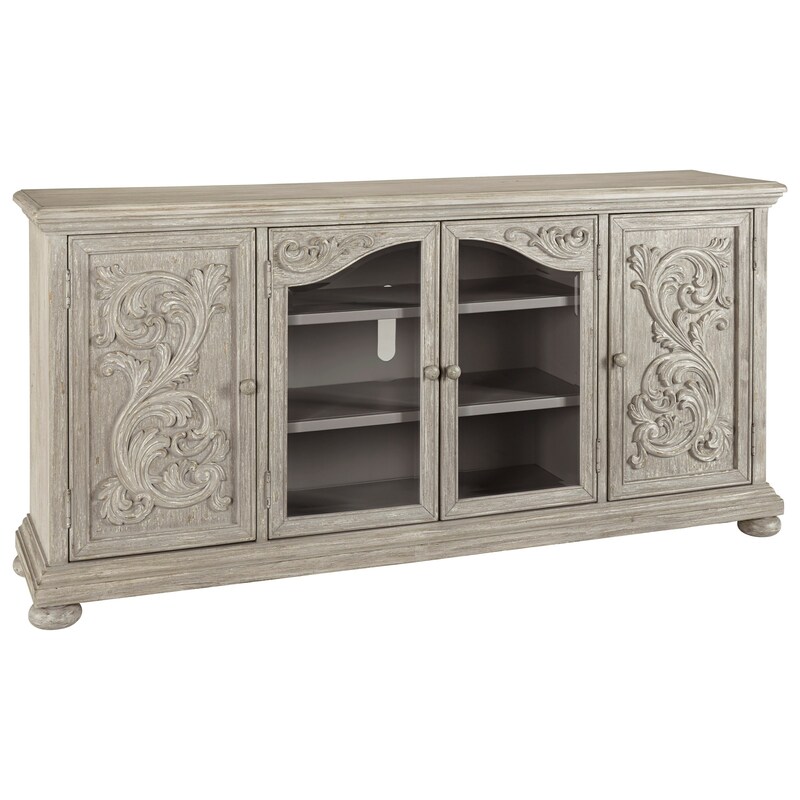 Ornate detailing adds charm to this spacious TV stand that will accommodate a 75" TV. The antiqued gray finish of the acanthus leaf carved front doors and tops of two center glass doors contrasts with a light tone top. Distinctive molding and bun feet complete the design. The Marleny Extra Large TV Stand in Gray Finish with Carved Doors by Signature Design by Ashley at Miskelly Furniture in the Jackson, Pearl, Madison, Ridgeland, Flowood Mississippi area. Product availability may vary. Contact us for the most current availability on this product. Finish Distinct gray finish with wire brush texturing and flaked paint effect. Light tone on top of TV stand for two-tone effect. Storage Side door opening (2) 15.75" x 15.13" x 28.50". Adjustable side shelf (4) 17.25" x 13.75" x 1.00". Center door opening (2) 31.50" x 15.13" x 28.50". Adjustable center shelf (2) 34.13" x 15.13" x 1.00"